There are days when even the most dedicated runner may lack motivation. Keeping things fresh and interesting can be a challenge in itself, but a few simple steps will keep things moving. Two of the most motivational things to do are keeping a log or journal and joining a local club. Runner’s Log Whether you are a sociable or lone runner, there is no better way of tracking your progress and chasing your goals than keeping a log of your running. At its simplest, this can be an old-fashioned diary in which you keep track of your times and miles covered, but far more flexible, motivating and accurate is joining one of the many online running communities. There is generally no cost involved in either registering for or using your online log (indeed, be wary of any that do charge), and with the increased use of both GPS watches and smartphone apps, you will even be able to update your status and distance automatically. As your distances and the time you spend running increase, it is vital to maintain a diet that supports the level of exercise you are undertaking. Continue to monitor the balance of carbohydrates and protein in your diet, and always avoid junk foods when training hard for an event. It is not uncommon for runners who have suddenly increased the intensity of their training (perhaps in the lead-up to a race) to find that their sleep becomes disturbed. Some studies suggest this may be due to an imbalance of body salts – sodium, potassium, magnesium and zinc. Use rehydration salt tablets (available from high-street chemists) after long or hot runs to help rectify this. There are many definitions for what exactly constitutes the core muscles, but broadly speaking they are the stomach, side and lower back muscles that form the foundation of strength throughout the body. Building the leg muscles with running (or additional cross training or weight training) is a great starting position, but a strong core is the foundation upon which long-term running is based. Running in an organized race is not the ultimate (or even intermediate) goal for all runners. If it’s not your idea of fun, then just continue enjoying your training and running purely for its own sake – and the sake of your health. 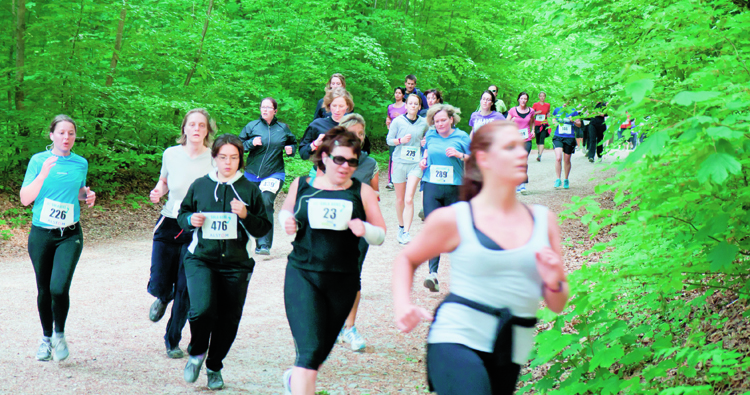 However, with increased confidence and ability, many runners find that they wish to participate in an organized event. With the use of the internet and listings in running magazines, it could not be easier to identify a race to suit you. Make some simple choices about where and when you would like to race (leaving plenty of time for training), pick the type of event and distance you want to run, pay the fee – and you’re ready to go! Make sure that your race goals are a balance of achievable and challenging. If you can already comfortably run for an hour, aim for a 10k race. Happy running for 90 minutes? Try a 10-miler or even a half-marathon. Push yourself and stay focused. When you’ve signed up for a race event, there are some top tips to keep in mind to have a successful day. Stay Safe: Write emergency contact details on the back of your number. Follow orders: Always obey safety instructions and advice. Enjoy yourself: It will all be over (relatively) quickly! Cool down: Walk for five to 10 minutes after finishing. There are plenty of short race distances – usually classed as ‘fun runs’ – but the 5k is probably the first race distance a new runner comes across and considers tackling. If you have followed even the most basic training plans in this book, a 5k race should be well within your capabilities. Top Tip: If the potential speed of a 5k feels intimidating, consider sticking with your training and pushing straight through to a 10k race. It is worth noting that because of their short distance – although it may not seem short to you yet – 5k races are often much faster and attract a considerable number of club runners aiming for league points and personal-best times. Don’t let this put you off! However slowly you intend to run a 5k race, you should always feel just as welcome and valued as the most proficient runner. There are thousands of 10k races across the country that you can choose from. A popular distance for runners of all abilities, the 10k can present its own challenge in terms of distance or, once you are comfortable with the distance, it can be a great event at which to test your speed. Mix It Up 10k races take many forms (including both road and trail), but, because they are quite short, many also take a more novel form to increase the challenge. These ‘novelty’ races may include obstacles, river crossings or other natural challenges to keep things interesting. Prices vary, but 10ks generally begin at around the £10 mark, making them very affordable. You’ll be amazed at how quickly you begin to accrue finishers’ medals and other mementos. As with other distances, running clubs are a great source of information on local races and events. 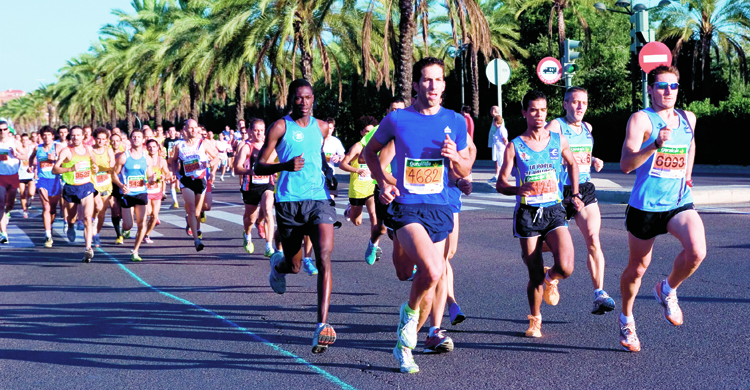 Most clubs also take part in leagues, which cover a series of races in the local area. Half-marathons are one of the most popular and increasingly staged distance runs. With a little dedication and training, this 13.1 mile challenge should be achievable for almost any runner prepared to put in the miles. Almost every city that holds a famed marathon also stages a half-marathon (not always at the same time), which means that if you love the half-marathon, but feel unable to step up to full marathons, you can still enjoy the experience of cheering crowds from London to New York. 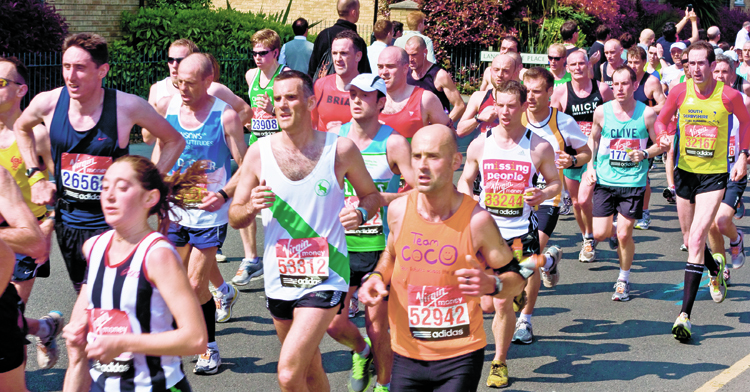 Here are some top tips for running a successful half-marathon. Fuel up: Make sure you have eaten and drunk adequately before the race. Plan ahead: Check how regularly drinks are provided along the route. Be prepared: Stay well hydrated pre-race. Keep it steady: Start at the same pace you aim to run throughout. Count down: Mentally tick off each passing mile. Drink and eat regularly: Fuel your run. Stick to what you know: Never try new kit, gels or bars on race days. Set a target time: But stay relaxed about sticking to it. For many new runners, the marathon, a gruelling 26.2 miles, is either the ultimate goal or a seemingly unobtainable distance – the reserve of either the elite or the insane. But, as with all running, the secret to undertaking this legendary event is slow, gradual increases in both confidence and ability. As long as you take it step by step, you can achieve that golden distance! Top Tip: Both half- and full marathons are traditionally marked in imperial miles (as are training plans). To convert to metric, multiply miles by 1.6. A marathon is approximately 42 km. Anyone preparing for their first marathon will have heard about – and undoubtedly feared – ‘the wall’. Sometimes this simply refers to the point on the run when you feel both mentally and physically spent, sure that you can’t take another step. Technically ‘the wall’ really means a state of hypoglycaemia, the point at which blood sugars plummet. Careful attention to both pre-race diet, and hydration and nutrition during the race, should help you break through to the other side. This blog post is based off information from our bestselling title, 'Running' by Justin Bowyer (ISBN: 9780857753892). 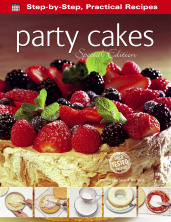 Check it out on Amazon here. Have a look at some more in detail tips on running a 10k race here. Going further? There is some advice on marathon running here.